The V5 System 2000 uses a new approach to EM data acquisition based on multiple, rugged, lightweight, independent data acquisition units (MTUs), which are synchronized by time signals broadcast by the GPS (Global Positioning Satellite) system. Use of 24-bit analog-to-digital converters provides wide dynamic range, simplified circuitry, and lower cost. 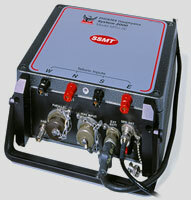 The V5 System 2000 is offered for the MT (Magnetotelluric), AMT (Audiofrequency MT) techniques. Future enhancements will provide data acquisition capability for other commonly used EM techniques, including Long Period Transient EM and Induced Polarization (IP).